Sunday 2nd December brings the second and final MVSLSC 2018 Junior Club Championships. 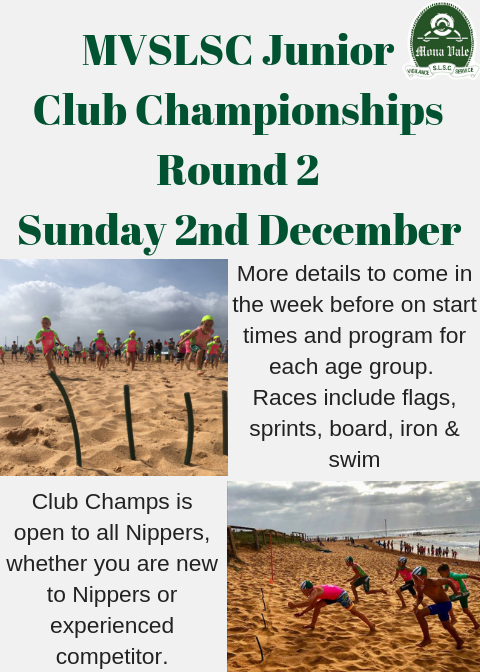 As with round one, this competition is open to all Under 8’s to Under 13 Nippers. The schedule has been altered and differs to Round 1 – please take a few moments to review the below start times and guide to the running order of the morning. Under 11’s, 12’s and 13’s are required to muster at the usual point from 8.15am for a 8.30am start. Under 9’s and 10’s are required to muster at the usual point at 8.45am for a 9.00am start. Under 8’s, please muster from 9.15am for a 9.30am start. Under 6’s and 7’s will start at 9.30am, as usual. The program will start with beach activities moving onto water events. IMPORTANT NOTE for Nippers who are currently participating ‘up or down’ their correct age group. Any Nipper participating in an OLDER age group, can be included in Club Championship results. 1. Shift to the correct Age Group for Club Championships to participate in all activities, with a chance to be placed. 2. Remain in the younger Age group, but please note that this Nipper can only participate in Water activities. Due to the ‘knock out’ nature of the beach events the Nipper cannot participate these activities. Please support and respect the decisions made by the Age Managers, Officials and Water Safety on the day. As such you will be asked to remain away from the competition areas (start and finish lines) to ensure our team are able to complete their roles free of interference. Furthermore, could I kindly request all parents demonstrate restraint and respect to all Nippers, including your own, when the kids are competing. Our goal is to share knowledge and experiences with surf and beach conditions and full participation should be encouraged rather than enforced, after all this is kids sport. Please could you avail yourselves on the morning to assist with the delivery of the program. If you have any issues or questions, please feel free to email the Nipper Chairman.